Trying to get a free CTEL practice test online or looking for the best study guide? I was keenly aware the California Teacher of English Learners (CTEL) has a lot of terminology, content knowledge and ‘must know’ teaching methods. I was long shot from passing and getting my CLAD/BCLAD credential. The problem started when I looked at the CTEL study guide PDF information about the test on the official website. I decided to look at the “Glossary” first. I had known students first as ESL, then ELL, but in California, as EL—and FEP, LEP, or LTL. Did I remember all the “best practice” English Language Learner teaching strategies that would be on the test? Would I have to name them? What were the California state laws I should know? Did I even know the typologies for learners? I panicked. How was I going to take the CTEL exam if I felt like I was the one who didn’t know the language? With my $260 and a semester of teaching on the line, I was running out of time to study everything. I had two choices: give up teaching or find a way to pass the CTEL. I chose to learn to get a passing CTEL score. How to Make Sure You Pass the CTEL the FIRST Time! …Cookie-cutter test prep tips like that don’t really help you get a passing score. Problem #1: You panic because you aren’t sure what will be asked—and you don’t want to fail. You’ll have opportunities to answer types of realistic CTEL questions found on the exam. You’ll be able to transfer this knowledge from CTEL multiple choice practice questions to essay questions. Problem #2: You’ve been out of the classroom or are new to California, so you’re not sure of the terminology or the state laws used on the test. Problem #3: You don’t have time to spend reading CTEL study guides, textbooks and other reference material. Problem #4: It’s been years since you have taken a ‘high stakes’ test that has your money and career on the line! Solution: CTEL practice questions give you the chance to build confidence as you gain the knowledge to pass. Who knew that taking a CTEL practice test could solve all of my test-taking worries? 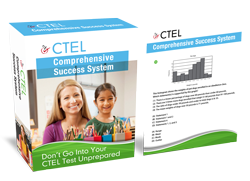 However, not all practice tests for the CTEL are alike. Be aware of the major differences! No CTEL constructed response questions and no example of a well-written constructed response. Every sample test should have sample constructed response questions AND sample answers! ✗	Set up a daily schedule of small chunks of time. Don’t cram! ✗	Leave time between CTEL practice tests (1 day up to a week) to allow yourself to absorb the explanations of the correct and incorrect answers. ✗	Between practice tests, focus study time on terms, acronyms, and strategies you do not know. ✗	Try to mimic the exam itself, giving yourself the allotted time for each subtest, practicing the pace as well as the actual test. ✗	Look for reasons WHY you choose incorrect answers: is there a pattern to the choices you make? You are not just learning the information, you are learning the test! According to the California Department of Education, there are over 6.2 million students in the state of California. Over 21% are English learners; over 42% speak a language other than English at home. If repeating your entire grueling CTEL test prep, stressful test taking ordeal and high testing fees aren’t enough to push you to pass the first time, you’ll be forced to go to do it all over again. Make your future students who need you the reason to practice. The more you prepare with CTEL practice test questions, the better your chances of passing and getting your CLAD/BCLAD credential—and the sooner you will be able to help students achieve their goals!